There's a long-held view among astrobiologists that planets need the stabilizing influence of a large moon to foster life. But a new study suggests that a stable tilt isn't a prerequisite for habitability — and that off-kilter planets may be more hospitable to life than stable ones. Unlike Earth and its highly stable tilt, some planets lean one way, and then change orientation within a relatively short time period. Scientists assumed that these wobbly tilt-a-worlds experience climate effects that turn them into glacial orbs, regardless of how far they are from their host stars. Image: Image Credit: NASA's Goddard Space Flight Center. But new models produced by astronomers from the University of Washington, Utah's Weber State University, and NASA now show this isn't necessarily the case. Wobbly Earth-like exoplanets, it now appears, may be less likely than fixed-spin planets to freeze over. They researchers say this is because the heat from host stars may be more evenly distributed. The spin of off-kilter worlds causes their poles to occasionally point toward the host star, which in turn causes the ice caps to melt fairly quickly. "Without this sort of 'home base' for ice, global glaciation is more difficult," noted astronomer Rory Barnes in a UW statement. "So the rapid tilting of an exoplanet actually increases the likelihood that there might be liquid water on a planet's surface." The researchers add that this tends to happen at the outer limits of a solar system's habitable zone. 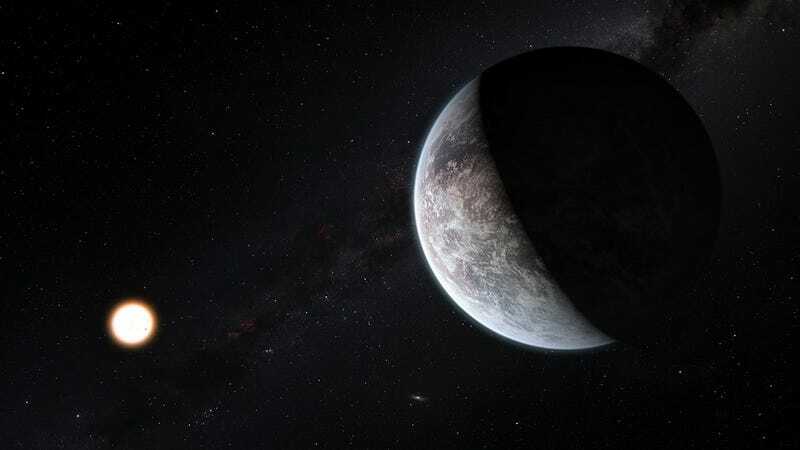 "Planets like these are far enough from their stars that it would be easy to write them off as frozen, and poor targets for exploration, but in fact, they might be well-suited to supporting life," noted NASA's Shawn Domagal-Goldman in a NASA statement. "This could expand our idea of what a habitable planet looks like and where habitable planets might be found." Indeed, the researchers say that the resultant expansion of the habitable zone could double the number of potentially life-friendly planets in the galaxy. Image: Credits: Photo ESA/DLR/Freie Universität Berlin. And as noted, the models also suggest that a large stabilizing moon is not required for habitability (which would be a strike against the Rare Earth hypothesis). The research suggests that planets don't require a stable tilt to be habitable. Without the moon, Earth's tilt — now at a fairly stable 23.5 degrees — might increase by 10 degrees or so. Climates might fluctuate, say the researchers, but life would still be possible. "This study suggests the presence of a large moon might inhibit life, at least at the edge of the habitable zone," added Barnes. Read the entire study at Astrobiology: "Effects of Extreme Obliquity Variations on the Habitability of Exoplanets." Supplementary information via NASA.